Monitoring is essential in modern network management to identify problems in underlying communication infrastructures of modern organizations. However, current monitoring systems are unable to recover their internal faulty entities forcing the network administrator to manually fix the occasionally broken monitoring solution. 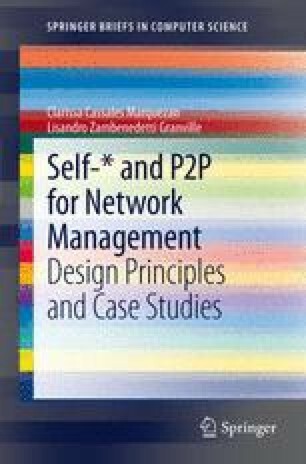 This case study, therefore, address this issue by introducing a self-healing monitoring solution following the principles of Self-* P2P design. The proposed solution combines the availability and communication transparency provided by P2P-based overlays with self-healing properties following the principles proposed for the self-* P2P design. The solution here presented considers a scenario of a monitoring system for a Network Access Control (NAC) installation.